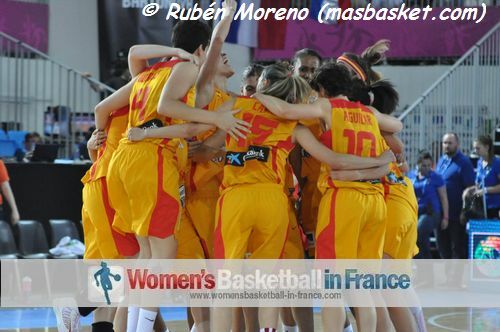 France and Spain will meet in the 34th EuroBasket Women final. Both teams came into the semi-final with a perfect record in this competition. In the other match on the semi-final day Belarus beat Sweden (69-48) to pick the last place from the European zone for the 2014 World Championship. Like in 2001 when France last hosted the EuroBasket Women, the hosts have qualified for the final. They overcame Turkey in a tough defensive game (57-49). 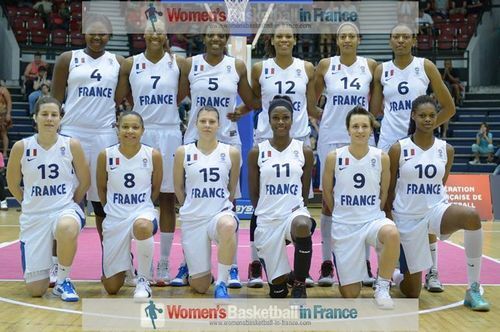 Emilie Gomis was the leading scorer for France with 11 points while Nwal-Endéné Miyem added 10 points. Edwige Lawson-Wade continued her farewall tournament with 8 points and 4 assists. For Turkey Esmeral Tuncluer was the best player on the court with 20 points. In the first semi-final, Spain opened the game against Serbia with a 10-0 run to never look back and cruise to victory (88-69). France got off to the best start possible with an 8-0 run while Isabelle Yacoubou-Dehoui was winning her dual with Quanitra Hollingsworth. Ceyhun Yildizoglu had no choice after four minutes but to call a time-out with his team trailing (4-12). Birsel Vardarli brought some order to the Turkish play with a three-pointer. But France continued to dominate the rebounds and edged the first quarter (22-11). The two best defensive teams of this EuroBasket Women tournament shared just 7 points for the first five minutes of the second quarter. France still had the advantage (27-13). Yet the defensive zone system of their opponents slowed them down for the rest of the quarter. As a result France added just 4 points to their counter. Turkey on the other hand were able to get some big points from their sharp shooters as well as clever play in the paint by Nevriye Yilmaz. Yilmaz worked under the basket to reduce her side's deficit to single digits by the break (23-31). Yacoubou-Dehoui again won her dual against Quanitra Hollingsworth as the match became more physical. The Turkish players also got penalised a lot at the start of the third quarter with fouls. France took advantage of the foul count to get extra free throws. However they failed to extend their advantage because Esmeral Tuncluer, Virdarli and Yilmaz stayed dangerous offensively for Turkey. France went into the last quarter with a lead of 9 points (49-40). Turkey slowley chipped away at the score. With four minutes left to play they trailed by just 5 points (46-51). France still struggled on the offensive end and Tuncluer brought Turkey right back into the match with a shot from the land of many to make it a 2-point game with 2 1/2 minutes to play. 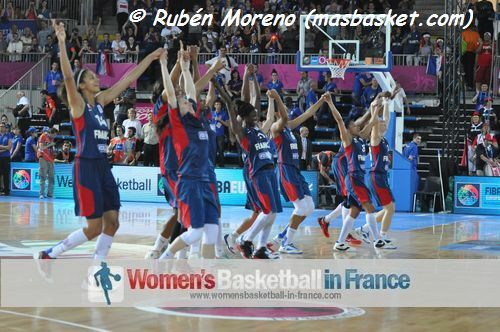 France then stepped up defensively and finished the game with a 6-point run to win the match (57-49). The first EuroBasket Women semi-final did not live up to expectation. Spain scored the first 10 points of the match and the contest was already over. Spain should have had a much larger lead (19-7) by the end of the first quarter. But they managed to miss a number of unmissable shots. Spain cruised all through the second quarter and went into the locker room ahead by 20 points (48-28) with Sancho Lyttlle and Alba Torrens leading the way with 16 and 11 points respectively. After the break the Spanish bench players were given an extended run as Serbia self-exploded. Milica Dabovic, Serbia's most experienced player, picked up 2 fouls in 14 seconds and then talked her way into a technical which resulted in her fouling out with 6:34 to play and her team trailing (28-51). Spain continued their display of team basketball and went into the last quarter leading (69-42). Dajana Butulija (15 points) and Jovana Rad (15 points) from Serbia decided to make the game interesting with a wonderful display of three-point shooting with two each during the opening minutes of the fourth quarter. 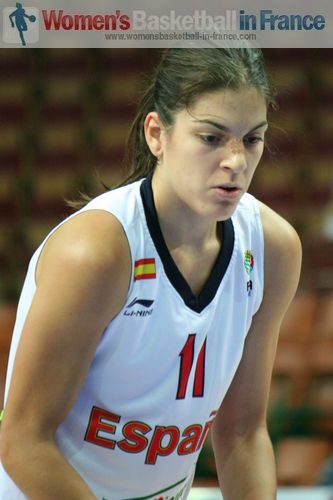 However for Spain Cristina Ouvina (19 points) was having an excellent game and was hitting some big shots of her own. By the time Elisa Aguilar made her entry in the closing minutes she hit a three-pointer for Spain to get their advantage back to 20 points. In the end Spain settled for a 19-point victory (88-69) with Lyttle scoring 22 points and picking up 11 rebounds. Marta Xargay (in picture), despite her foul problems, finished with 13 points. Torrens did not add any more points after 11 from the first half. Sasa Cado from Serbia also finished with a double-digit score of 10 points. Serbia's major concern for the bronze medal match is the knee of Ana Dabovic who limped off the court with 8:34 left to play. 3 three-pointers for Natallia Anufryienka (in picture) at the end of the first quarter put Belarus in front for good (20-16) in their EuroBasket Women classification game against Sweden. With Belarus knocking down three-pointers at will Sweden were forced to abandon their zone defensive system. However the damage was already done and Belerus were able to extend their advantage quarter by quarter to comfortably win (69-48). Anufryienka led the Belarus attack with 17 points. Yelena Leuchanka and Anastasiya Verameyenka followed up with 16 and 14 points respectively. For Sweden the Eldebrink twins had 11 points each. With Belarus picking up the last European place for the 2014 World Championship, the 5-6 classification match between Belarus and the Czech Republic is now meaningless.